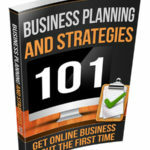 Grab a Free Business Planning ebook! To help you start and grow your business, we’re offering you a FREE eBook to the first 100 vistors. Just put in your email so we can send you the Download Link. We respect your privacy as you do. We will never share your details with anyone else.